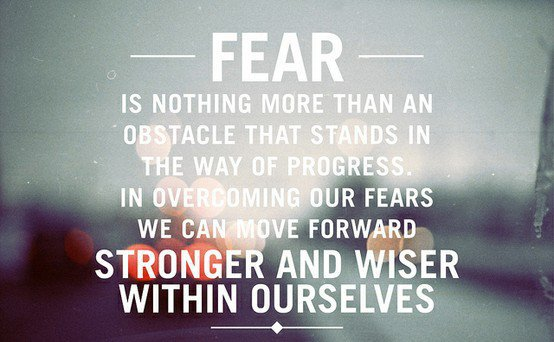 It is amazing how much control little things can have in your life when fear is involved. Since I have started training with Christian Peterson he has had me doing CrossFit workouts. So I far I have really loved them as they are high intensity but only last about 15 minutes. I just don’t have the time right now to be spending hours in the gym. On the agenda for this week were box jumps. 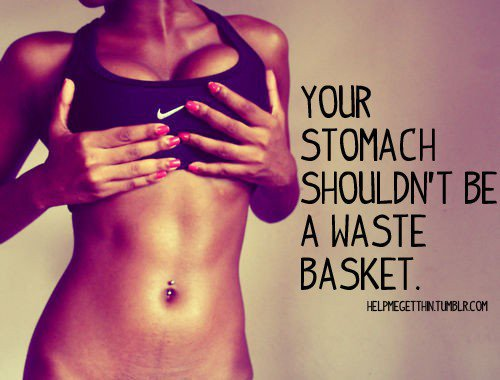 Now I have seen people do these in the gym and I have seen Biggest Loser contestants do them. They terrify me. There are not a lot of things I am afraid of, but these are one of those things. SCARED TO DEATH! 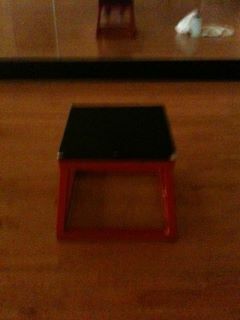 My sister wanted to work out with me yesterday but she didn’t have any boxes for us to do the box jumps. So we improvised, we decided to use the bottom step. This was still terrifying to me. My sister made it look effortless, but she is almost 100 pounds lighter than me. She told me to just put my feet together and jump! It worked! I was able to do three sets of ten. I had conquered my fear…sort of. 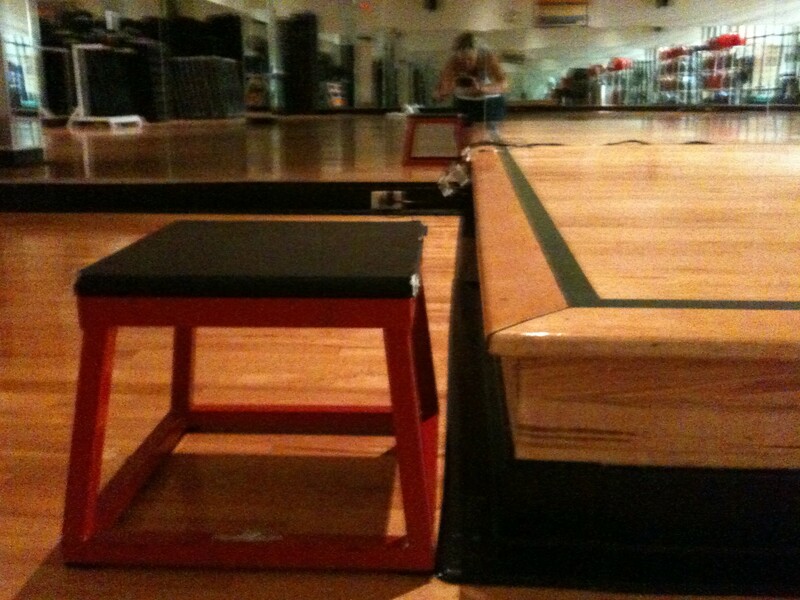 I went to the gym today determined to do an actual box jump. So I grabbed the box and took it into the studio so nobody would see me if I made a fool of myself! I just could not get myself to jump. The fear was taking over. I don’t know exactly what the fear is, but I think it is the fact that the box is a very small platform to land on and I am afraid of it moving as I jump on it. Although the step is also a small platform, I was certain it wasn’t going to move. There was actually a step in the studio and I had no problem doing thirty jumps up onto the step. I decided to bring the box over by the step to see how much higher the box was. As you can see the box is not substantially higher than the step, but it is higher. I literally stood in front of this box for thirty minutes trying to gather the courage to just JUMP! Everytime I tried, I couldn’t move. I told myself I was not leaving the gym until I had jumped at least once. I even started tearing up because I was so angry that I was letting this little box take over my day. How could something so little cause so much fear? I don’t know how I was finally able to do it, but I DID IT! Being the emotional person that I am, I actually started to cry. The box didn’t move, and I didn’t make a fool of myself. I could finally go home. But I didn’t. 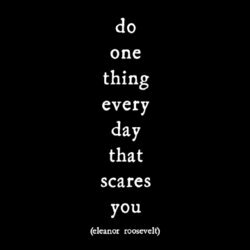 I did four more, having to stop to gather the courage before each one. After I had done five, I told myself I needed to try to do five consecutively which I did. Then I did ten more consecutive jumps!! I started out being afraid to even jump, and by the time I went home I had done 20 jumps! This was after riding 15.83 miles on the bike! My fear is conquered…well at least until next time! This love affair of mine has been going on for as long as I can remember, and I don’t foresee it ending anytime soon. It makes me happy, it makes me smile, and it makes me feel good (but this feeling is usually short-lived). I know that this love affair is wrong, it goes against everything I am trying to accomplish, but I can’t help myself. As much as others tell me it is bad for me, and I need to end it, I can’t. It won’t end until I am ready, regardless of what others think or say, regardless of whether it is right or wrong. It honestly sometimes makes me sick to my stomach, but I still can’t end it. I wish I could say this love affair was with a gorgeous man, but unfortunately I am still looking for him. My love affair is with sugar, especially candy! A friend of mine has told me that I have an emotional attachment to sugar, I prefer to call it a love affair. I love candy, I love cookies, I love sweets! I realize this love affair is a huge obstacle to me losing weight. As a challenge, I did give up sugar and starches for an entire month. During this time the weight came off really quick, but it wasn’t a realistic change for me. The one thing I can say about that month was that I felt AMAZING! When I cut out sugar, white flour, and starches I basically inadvertantly cut out gluten (for the most part). Quite honestly I felt the best I can ever remember feeling. The saddest part about that last statement is that wasn’t even enough to get me to stop eating sugar. The fact that I know I could feel the best that I have in my entire life if I quit eating sugar, and that is not enough for me to actually do it leads me to believe there probably is some emotional aspect to it. I have no idea what it might be, but awareness is the first step, right? Do you have a love affair with sugar? If so, any tips or tricks on how you deal with it? I do have to say that my eating is better than it was two to three years ago, but there is a lot of room for improvement. I need to find a happy medium because life is too short to not enjoy the things you love!